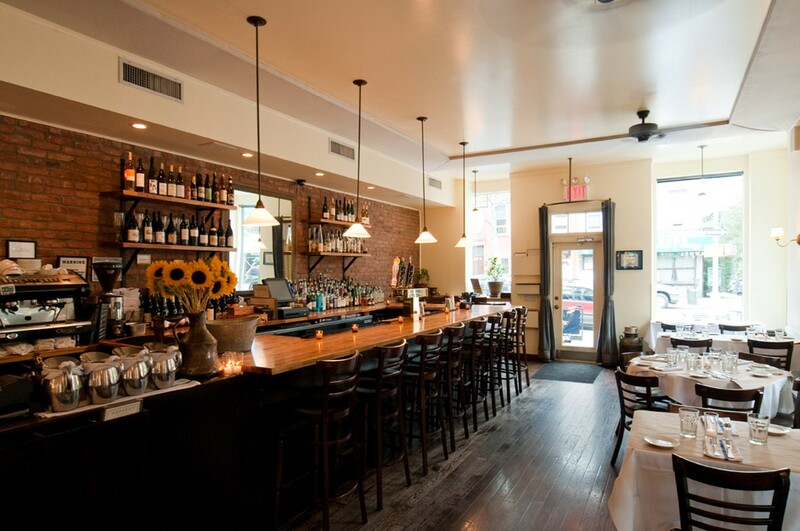 All the spots where you should be eating in Carroll Gardens. You might remember a review/rant we wrote about Tipsy Parson and the so called "comfort food" there that really isn't comfort food. In case you were wondering where all that anger came from, it has built up over time from repeated disappointment. The bottom line in most of these cases is that if you want real comfort food, skip the trendy new spots and go to Harlem or Charleston. Or maybe just go have dinner at grandma's. We're sure she would love to see you. But there are some exceptions to the let downs, and Buttermilk Channel is one of them. It exceeded our expectations, not only when it comes to the menu of classic American guilty pleasures, but also the restrained and tasteful decor. No antique phones or kitschy mugs on display here. This is simply a true Brooklyn neighborhood hang, and it's equally popular among young hipster singles and the families that fill it for Sunday dinner. The fried chicken is one of the best you'll find in town, and almost everything else you'll eat here is fantastic. Just don't over do it - this food is rich and we suspect that it's not entirely healthy. Then again, we're not doctors, so who's to say it isn't? Oh right. Doctors. The snacks are a nice way to kick things off, but we recommend sticking to the pickles and moving on to the house cured meats or another starter. The almonds are fine, and the sweet potato croquettes are a nice idea, but neither are particularly great. They'll just occupy space in your stomach that could otherwise be filled with something excellent. I want you to take some time and think about that. Thick cut, mustard glazed, grilled bacon. I've never even tried to put bacon on the grill. I'm too afraid of causing a black hole from so much awesome happening at one time. The apparent result is tangy, smoky strips of pork that are stupid good. Eat some greens. You're going to need them to survive the day after this meal. Buttermilk Channel is one of the pioneers of the neo-fried chicken movement in NYC, and for good reason. Their version is perfectly cooked with crunchy skin and delicate moist meat, served on top of a cheddar waffle. Remember that black hole I mentioned earlier? This is good enough to rip apart space and time. Yep, that's right. Delicious duck meat ground up and formed into what looks like a burger, but is called meatloaf. Rich and incredibly dense and flavorful. You should be eating this and simultaneously putting yourself on a donor list for a new heart. We were somehow tricked into ordering this. Don't make the same mistake we did. If you're looking for fresh pasta, head down the street to Frankie's. This was bland and unsatisfying, which you would think to be a cardinal sin at Buttermilk Channel. A flank steak for all intents and purposes, but not just a flank steak. This was a big piece of meat, served with a bread salad and a cow shank so you can spread bone marrow on well...everything. It's really good, but it's also enough food to feed a small family or one new Luke Wilson. Want to know another reason why this place is awesome? They serve a root beer float. Nothing fancy, just a straight up float. And they let me order it even though I ate all this food.